well we woke up nice and early this morning knowing it was going to be another hot day, would have liked to get up alot earlier than 6.30am but there was no use as we had to return the damn toilet keys and get our deposits back ... and the office didn't open until 8am ... I hate that in a caravan park! I didn't really like this place! So the sun was pretty hot even at 8.15am this morning. We had to ride back into Moonta town itself and then take the road that goes to Maitland which is inland on the Yorke Peninsula. 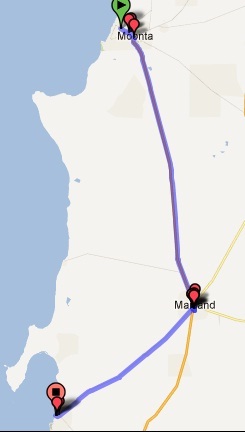 It is a steady climb up to Maitland (which is 200m above sea level) - you actually don't really feel the climb except that there is a little resistance from 10km to 40km the road tends to go in steps up a hill. We had a good strong tailwind that was blowing from a north north east position. It took us just over 2.5 hours to get to Maitland where we had a cuppa and bought our dinner for tonight - salads - too hot for anything else. From Maitland the road goes in a west south west direction and by now the wind is a real strong cross wind. Not much cycling for the first 10km as it is a gentle down hill. Upto Maitland it looks really dry but all the land is full of yellow crops it is not until you leave Maitland and start coming down that you can look out over to the ocean and see an aray of green, yellow and brown fields ... lovely really ... would have taken a photo but didn't want to stop on my down hill! Port Victoria is a tiny place on the coast line and the caravan park is again cramped but fortunately for us we are on the middle tier under the shade of a tree and the only ones on the front of this tier (as no one else can fit here!) while the caravans are behind us, we can see the vans on the lower tier but we can also see the ocean ... not the perfect spot but good enough for us. There is a wonderful camp kitchen so our salads are going to be cold for dinner and not warmish! Lots of people here and the park is not that big but like I said there is no one to the left or right of us. as you can see Kouta is flaked out completely ... lucky he has a funny hair cut to keep him cool! 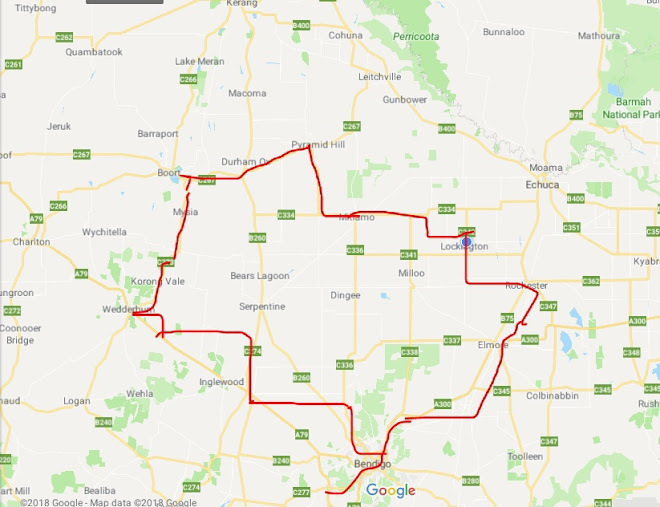 Tomorrow we are either in Point Turton or Minlaton ... depends on how we go with the headwinds that are forecasted tomorrow ... that is the good thing about the Yorke Peninsula ... the towns are alot closer together and there is more roads to choose from!